Trees and greenery the gridded streets of Oranjemund, lending it the look of a luscious oasis, sharply contrasted with the all-encompassing aridity of the Namib Desert surrounding it. This little-visited town, built on sweat and diamonds, is safe, sleepy and deceptively fascinating. In the 70s, Oranjemund was at its prime. Populated primarily by young businessmen and their wives, Oranjemund was a pleasant pit-stop on the road to success. Tennis clubs, gun clubs, parties, good health-care and free schooling were just some of the perks that the employees enjoyed. But things have changed since then. 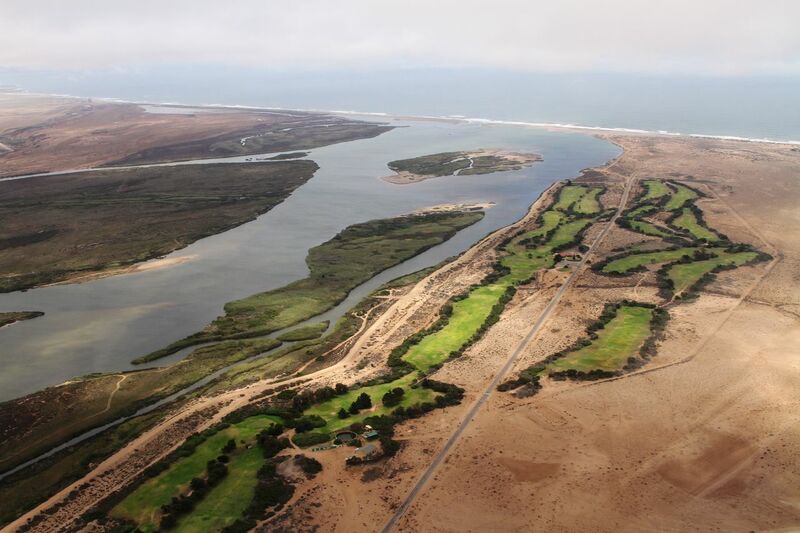 In it’s heyday, the mining giant, DeBeers afforded a number of luxuries to their employees and established one of the best 18 hole golf courses in Namibia. A course where one is almost assured to pass the odd Ostrich or Oryx as you hit that ball down the green fairways with the golden sun reflecting of the distant sand dunes of the mighty Namib sandsea. Hard-hit by the economic downturn, the once-bustling and somewhat quaintly colonial town has now lost some of its former luster. Its population has almost halved and houses have been abandoned and left to face an arid future. Resident stray gemsbok roam the near-empty streets like die-hard party-goers who’ve suddenly realised that everyone else has gone to bed. But despite encroaching desertion, the town still has much to offer. Today Oranjemund is a pristine town, providing a pleasant surprise to those visiting the remote settlement with its unspoiled nature, clean beaches dotted with small huts ideal for weekend braais and family outings, undisturbed birdlife in the wetlands, historic places, and, of course, the diamond mine. 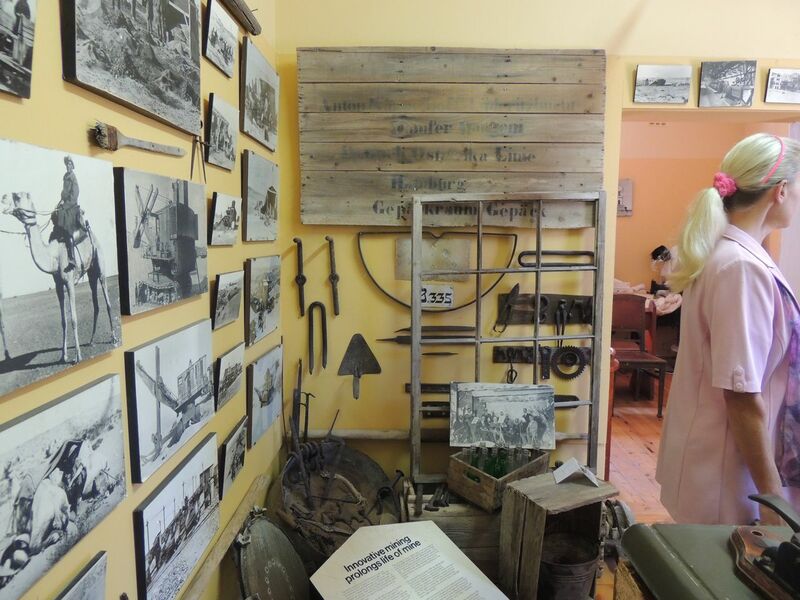 Make a point of visiting the Jasper House Heritage Centre, where various historic and mining artifacts are on display. With the discovery of an old 15th century sail ship buried in the sand and laden with gold Portuguese and Spanish coins, ivory and and other artifacts, plans are underway to create a museum for this find. See how pioneering miners lived in years gone by. How they adapted to living and working in an arid and challenging Sperrgebiet. Tours every workday between 11:00 & 14:00. In these modern times, the day-to-day meet-and-greets among the townspeople still take place during shopping trips for grocery at the Spar Supermarket. There is also a popular hangout, Muckie’s Motores, where locals wait for their cats to be cleaned while catching up on the latest town news. Situated between the town and Swartkop Gate, the Swartkop Nature Reserve rises just 70 metres above sea level, presenting rare plants, some of them occurring in the northern Richtersveld. The hill forms a link with northern Namibia, and features some typical Namib flora. Close to the Oppenheimer Bridge, lithops – popularly referred to as ‘living’ or ‘flowering’ stones – and even Tylecodon schaeferianus, can be found among the rocks overlooking the Orange River. Secluded areas along the banks of the river present perfect places to pitch your tent and the giant sand dunes surrounding the town are a challenge to off-roaders and sand-boarders alike. Surrounded by the wild Atlantic Ocean, the Orange River (and its bird-abundant wetland), the succulent Karoo and the Sperrgebiet National Park, Oranjemund is quite literally a wealth of diverse and unique beauty, pending rediscovery. Oranjemund can lay claim to being the only town to be surrounded in all it’s entirety by the Sperrgebiet National Park. Oranjemund has a well established Off Road Club, with it’s own off road tracks. The club organizes controlled Dune rides monthly and routinely arranges Rallies for quads, bikes and pipe cars. Club is situated on Beach Road with the entrance clearly marked (large white tyre). The town also boasts tennis and squash courts, a bowling and jukskei Club. There are also numerous restaurants, franchised shops, bars, free heated outdoor swimming pool, library, banks with ATM’s and a nightclub in the town. The best kept secret in Oranjemund is fishing at the Orange River Mouth. December and January are known to be the best months for catching a wide variety of freshwater and ocean fish. In the summertime, the river mouth and beach is packed as the locals reel in the Steenbras, Galjoen, Shad(2-4kg), Yellowfish and Kabeljou’s. Oranjemund has 4 km of unspoilt and wild beachfront. If you are into river sightseeing, bring your paddleski or watercraft with you, and take a lazy afternoon paddle amongst the many reed strewn channels in our part of the RAMSAR proclaimed Orange River Wetland. The Birdlife on this part of the river, is one of the richest along the entire South Western coast of Africa, Pelicans, Flamingo’s and Cormorants are all at play here. Oranjemund Golf Course, the unknown diamond of Namibian golf courses, is nestled along the banks of the mighty Orange River. Amateur golfers and pros will have their skills seriously tested by an unforgiving course, which, with its long and wide green fairways and dense rough for those who dare to wander off the fairways. This is a test of golfing skill and the courage to persevere. 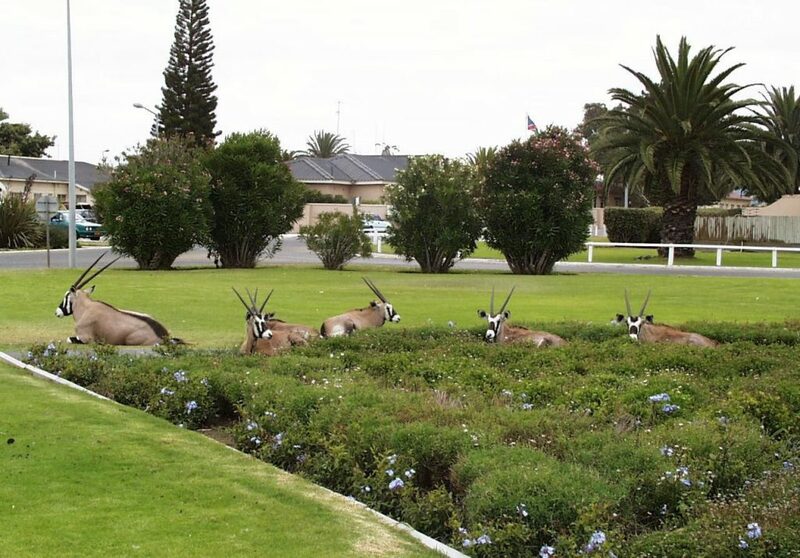 With an abundance of wildlife like Gemsbok, Ostriches, Jackals and the occasional brown Hyena as visitors to the course, it is an ideal breakaway for the avid golfer. With a variety of bird life along the Orange River the golf course is the ideal place to indulge not only in the passion of golfing but also bird watching. At the 19th hole one can sit and relax in comfort after a hard day of golfing with one of Namibia’s best known products the Windhoek or Tafel beer in hand and relive all your glorious achievements from the golf course. Oranjemund lies in the protected area (Sperrgebiet) of Namibia and therefore certain legalities apply to any visitor. For the visitor to Oranjemund it is advisable to arrange your visitors permit beforehand to avoid any disappointment. Oranjemund Bowling Club Tel: 063 – 23 2106.